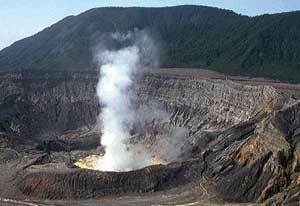 Located 15 miles northeast of Liberia in northwestern Costa Rica, is the Rincón de la Vieja Volcano and National Park. This massive volcanic complex includes at least nine different craters with its two well-known cones: the quiet, 6,286-foot Santa María (the highest point in the park) and the steaming Von Seebach crater with its 1,640-foot-wide acid lake. According to the Smithsonian's Global Volcanism Program, its last major eruption occurred approximately 3,500 years ago but it has since remained highly active with a periods of smaller eruptions. Its most recent one occured between February and September 1998. Although it has remained relatively quiet since then, rivers of lava continue to boil beneath its external layers, which fuel the series of volcanic hot springs, mud pots, and geysers. The area is also located within a three-mile-wide caldera that is exposed on the southern side with most of its activity centered on its younger southeastern flank. Due to the volcanic hot springs, the accessible hiking trails, and the wide variety of wildlife (with more than 300 species of birds), the park has become one of the top tourist destinations in the northwestern Costa Rica. It is often stated that the park is a smaller version of the Yellowstone National Park in the United States. 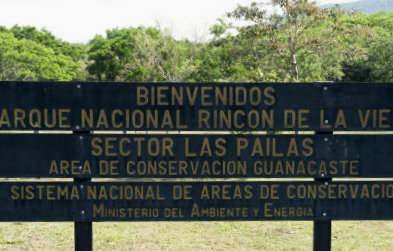 There are two main entrances to the national park: the Santa María and the more popular Las Pailas ranger stations. Since there is no public transportation to either entrance of the park, the best way to get there is by driving yourself, taking a taxi (approximately US$20 from Liberia) or booking a tour through a hotel. If you choose to drive yourself, remember that many roads toward the park can become very rough and a vehicle with good clearance and four-wheel-drive is highly recommended. To reach the Las Pailas entrance, drive approximately three miles north of Liberia and turn right at the well-marked dirt road toward the park. After seven miles, you arrive in the village of Curubandé. Continue on for another four miles and look for signs to the Hacienda Guachipelín, which is a 3,700-acre working ranch and the best place to find guides and book a wide variety of tours within the park. More information can be found at their website: www.guachipelin.com. To reach the Santa María entrance, drive through the northeastern portion of Liberia and head toward the village of San Jorge. From there, it is a well-marked 16-mile journey to the park. Again, the roads can get pretty rough, so a high-clearance vehicle is the way to go. The park entrance fee is US$10 per person (per day) and the hours of operation are from 7 a.m. to 5 p.m. with the last admission at 3 p.m. Due to the active geysers and hot springs around the volcano, guided hikes are highly recommended since they always have the safety of their guests in mind. For the more adventurous, self-guided hikes are also available and trail maps are provided by both the ranger station's at both entrances. Since safety is of the the utmost concern, visitors are required to hike only one trail at a time in the park before reporting back to the ranger station. If they fail to do so, the park rangers are required to begin a search. Las Pailas Summit Trail - Beginning at the Las Pailas ranger station to the west, this trail is considered by many as one of the best hikes in the country. 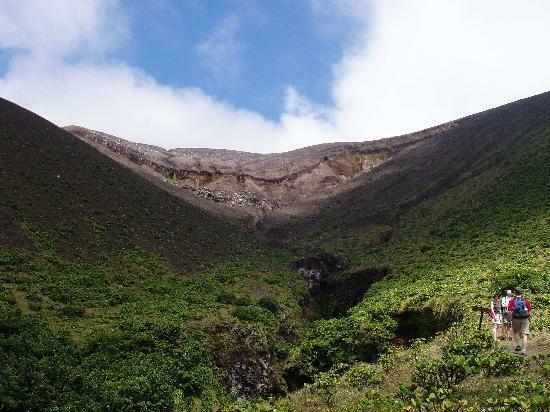 It includes a manageable five-mile journey up through tropical forests with views of bubbling mud pots, hot springs, fields of wild orchids, lava rocks, and the steep slope toward the summit. Hikers should generally be prepared for unpredictable cold weather at the summit and visibility issues due to the usual blankets of clouds near the top. 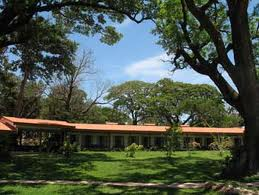 But for the lucky who arrive when it is clear, the summit offers spectacular views of the 1,640-foot-wide crater lake, the Guanacaste Plains, Lake Nicaragua, and the Pacific Ocean. Santa María Summit Trail – Beginning at the Santa María ranger station to the east (rumored to be former President Lyndon Johnson’s country retreat), this eight-hour trek includes views of tropical forests and plenty of wildlife before emerging onto hardened lava flows and lava rocks on the steep slopes near the summit. Again, hikers should come prepared for unpredictable weather conditions especially due to the cloud cover and mists. Las Pailas Loop – Beginning at the Las Pailas entrance, this 3.75-mile circular loop includes views of the steaming fumaroles and mud pots, a mini-volcano and boiling mud fields that have compared to Yellowstone National Park in the U.S. At a casual pace, it takes approximately two hours from start to finish. 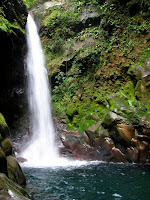 Waterfalls – Catarata La Cangreja is located east of Las Pailas. This three-mile loop takes approximately two hours and travels through tropical forests with views of several hot springs, a crystal-blue lake. a beautiful 98-foot waterfall, a crystal-blue lake, and several hot springs. Cataratas Escondidas is a 2.5-mile loop with views of another beautiful (but slightly smaller) waterfall. Sendero Encantado – This trail travels along the lower slopes and offers views of the park’s lowlands, a cloud forest, fields of purple orchids, and a variety of wildlife. It eventually links with the longer Las Pailas trail to the volcano's summit. I have been examinating out a few of your stories and it's pretty nice stuff. I will definitely bookmark your site. Normally I don't learn article on blogs, but I would like to say that this write-up very compelled me to try and do so! Your writing taste has been amazed me. Thanks, very nice post.